There are so many sayings and catch phrases out nowadays that the media creates in an attempt to turn the mundane into something more memorable. Think “Carmaggedon” just a couple of weeks ago. More, recently however, I read a phrase that I have never seen before. While I was reading last months “Money Talk” in The L.A. Times by Liz Weston who writes an advice column that helps average people like you and me on issues of personal finances- she actually diagnosed a reader who had written in to vent about how much he has cut back on his expenses and more importantly how frustrated he was by having to live a life of constant financial austerity with… “Frugal Fatigue”. This phrase got me thinking about- where do we draw the line when it comes to living a sensible life within our means vs. living a life of depravity? Obviously this particular topic is as unique to each individual as our own fingerprints, but is there such a thing as being too frugal? In short, my answer would be YES. Cutting back on premium cable channels and switching from incandescent light bulbs to fluorescents is one thing, wearing scarves and a down jacket to bed and risking catching pneumonia in the winter time to save a couple of bucks on your heating bill might be a little much. I think it is actually far easier now to get caught up in the whole notion of the “Less is More” approach than it has been in the past. Being thrifty and pennywise does not carry the same negative stigma that it once did, in fact most people brag about their cost cutting ideas rather than being embarrassed by them. I've witnessed it first hand, with family members comparing DWP bills to see who has managed to save the most that month. More and more people are trading in gaudy, ostentatious vehicles for more practical and understated means of transportation, with "savvy" becoming the new "bling" when it comes to consumer spending. I recently had a mental tug-a-war with myself over an Ipad2 that was given to me as a gift from a very generous client. I kept it for a total of 3 months and used it maybe half a dozen times before I finally caved and sold it on eBay. I thought that I would miss it the same way that I thought I needed it, but in the end I think I enjoyed saying I had one a lot more than I actually needed one. I enjoyed bragging to all my friends about it and I liked adding it to my increasingly growing collection of Apple products, but the money I made from selling my iPad2 with its virtual keyboard will go toward sending me on very real vacation. Being frugal or fiscally responsible is just like being on a diet. Those who try to do too much too soon often fail in the same way that a person who loses 25 lbs in one week by starving themselves will almost always gain it all back and then some. 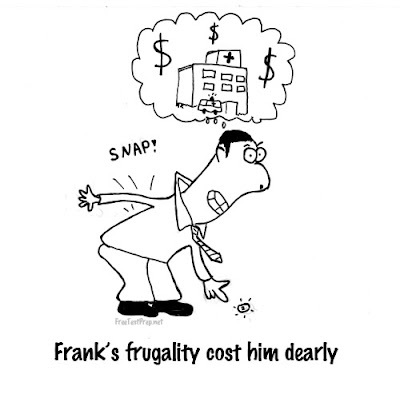 Setting obtainable and realistic goals over time is the best way to get a handle on your finances and treating yourself to that Latte or dinner out a couple of times a month as a reward for all of your discipline is the best way to stave off “Frugal Fatigue”.